BMW X1 – Signficantly greater Cargo Capacity: at 58.7 cu. ft. versus the Mercedes Benz model at only 43.6 cu. 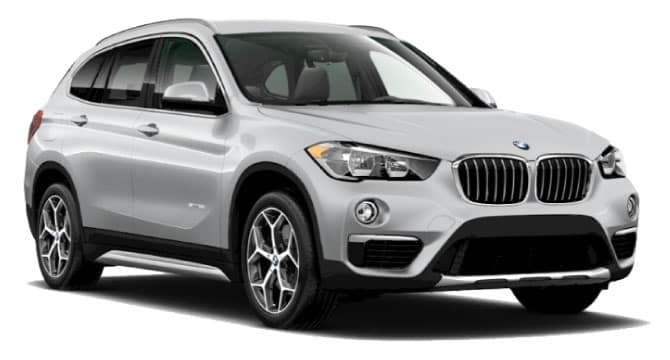 ft.
BMW X1 – Maintenance: Includes BMW Ultimate Care, 3 YR/36,000 MI factory-recommended maintenance*, versus the Mercedes-Benz offering of a pre-paid maintenance option at time of purchase. So if you want all the get-up-and-go capability, plenty of cargo room to store your gear, and the confidence that comes with driving BMW’s xDrive All Wheel Drive system, then the 2018 BMW X1 xDrivee28i is the smart choice for your luxury crossover purchase. 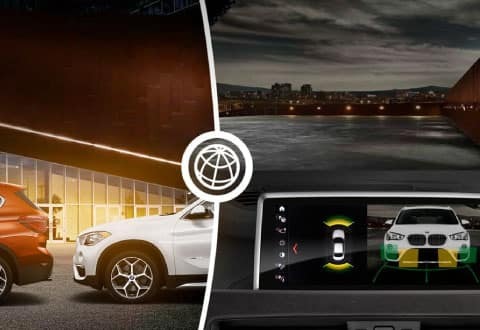 Contact BMW of San Francisco to explore all of BMW’s latest technologies first hand, and test drive a fully loaded 2018 BMW X1 today! 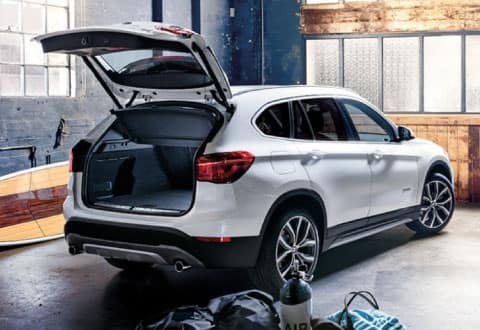 BMW X1 – Significantly more Cargo Volume: 58.7 cu. ft. compared to the Audi’s 50.3 cu. 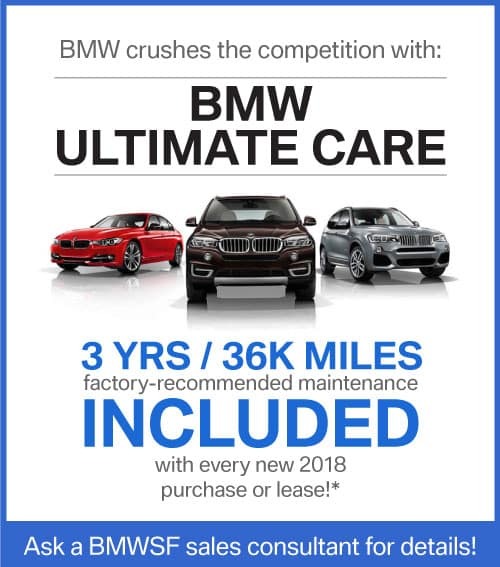 ft.
BMW X1 – Maintenance: Includes BMW Ultimate Care, 3 YR/36,000 MI factory-recommended maintenance*, versus the Audi’s 1 YR/10,000 MI no charge first scheduled maintenance. Overall, the 2018 BMW X1 xDrive28i pulls ahead of the Audi Q3 Quattro Premium Plus with greater acceleration, significantly more cargo volume, better rated fuel efficiency, greater power and performance, and a far more advantageous covered maintenance plan. 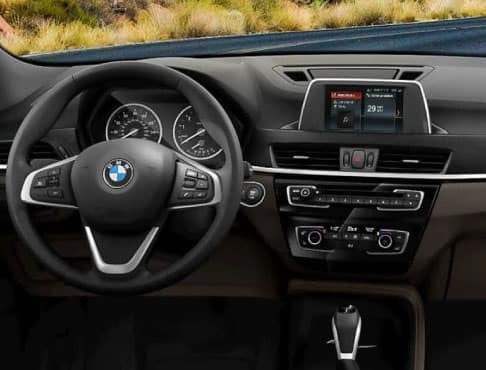 Explore its many advanced features and experience the difference with the BMW X1 first-hand! 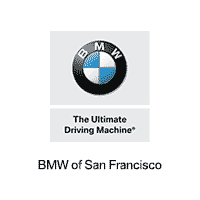 Contact BMW of San Francisco by calling 800-872-2697 or submitting the form on this page now. BMW X1 – Cargo Volume: 58.7 cu. 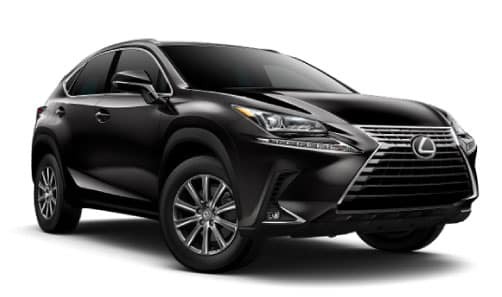 ft. versus the Lexus NX 300 at 54.6 cu. 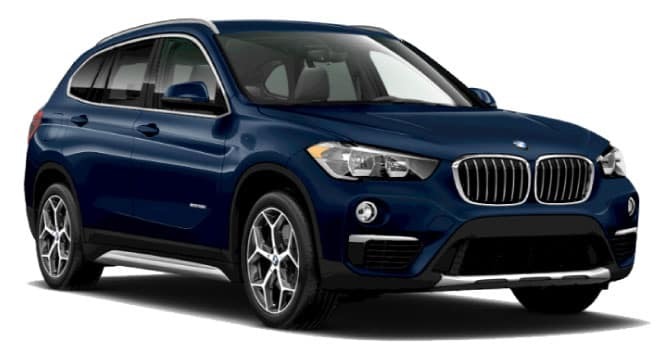 ft.
BMW X1 – Maintenance: Includes BMW Ultimate Care, 3 YR/36,000 MI factory-recommended maintenance*, versus the Lexus 6 MO/5,000 MI and 1 YR/10,000 MI no charge first and second scheduled maintenance. 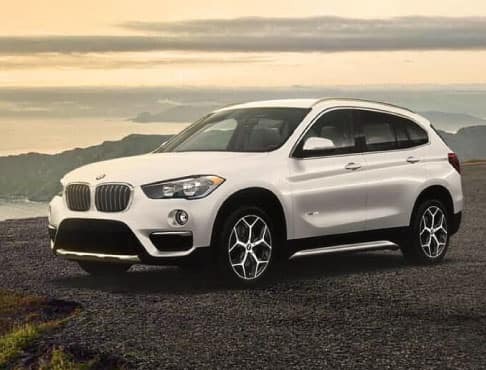 With greater acceleration, better fuel efficiency, more cargo storage, convenient standard features for your active lifestyle, and a more advantageous covered maintenance plan, all for a lower starting MSRP, the 2018 BMW X1 xDrive28i is clearly the smart choice in small luxury SUVs. Want to learn more? 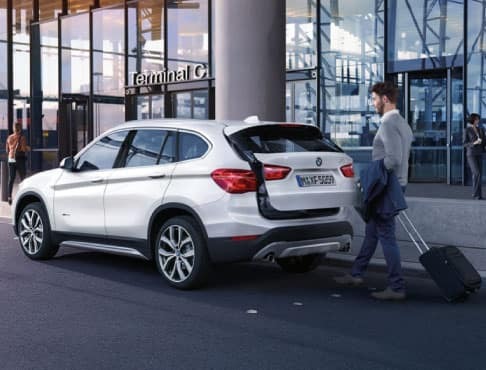 Contact a 2018 BMW X1 expert at BMW of San Francisco today to experience all that the X1 has to offer first-hand. The New 2018 BMW X1. Through San Francisco and beyond, make every drive a joyride. The new 2018 BMW X1 goes far beyond utility to offer adventure in every drive. It’s the perfect balance of thrills and peace of mind, with advanced safety features, exhilarating options, and all the handling you expect in a BMW. 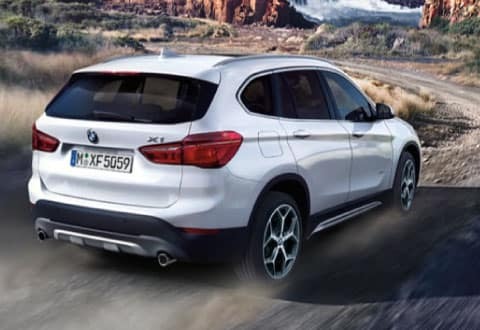 The X1 takes the power of 228 horses, top-rated safety features, and the agility you expect from a BMW – and packs them perfectly into the most compact Sports Activity Vehicle® in the world. Simply submit the form on this page or call 800-872-2697 now to schedule your personal 2018 BMW X1 test drive today with your friendly BMW experts, BMW of San Francisco. Store more. 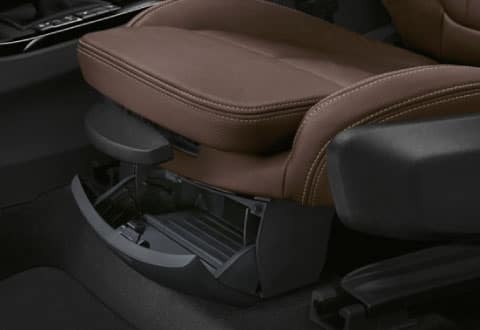 Cargo space in the BMW X1 expands to an impressive 58.7 cubic feet with the seats folded down. 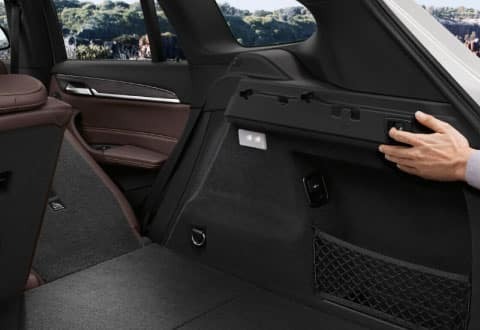 Storage compartments include a center console and cargo floor space, and the versatile 40/20/40 rear folding seats add flexibility to who and what you’re packing. So whether your BMW X1 takes you around San Francisco or across the country, you don’t have to leave anything behind. The new 2018 BMW X1 goes far beyond utility to offer adventure in every drive. It’s the perfect balance of thrills and peace of mind, with advanced safety features, exhilarating options, and all the handling you expect in a BMW. From the steep roads of San Francisco to the open roads of the Bay Area highways and beyond, no matter your destination, the BMW X1 challenges everything you expect from a Sports Activity Vehicle®. Ride confident with xDrive, BMW’s intelligent all-wheel drive system, which redistributes power to the wheel with most traction when slip is detected or anticipated. When coupled with standard all-season Runflat tires, BMW xDrive means peace of mind on slick or uneven roads. See and hear your surroundings. 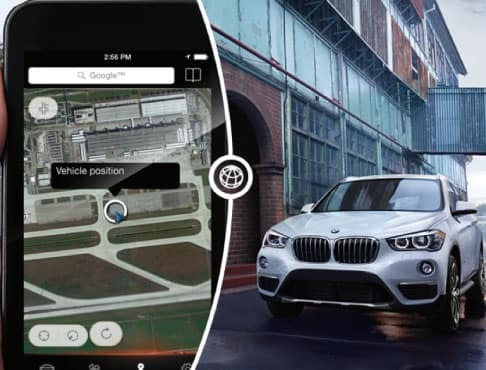 The X1 Park Distance Control uses an array of four sensors to measure distances between your BMW and nearby obstacles, giving you visual and audio guidance for a perfect parking job. Get vital driving information – and see what’s coming – with the BMW X1 Head-up Display. 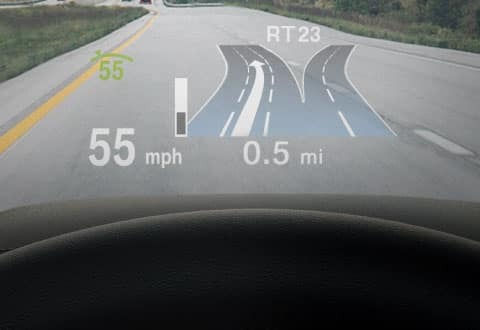 Navigation guidance, collision warnings, and speed limits are projected directly on the windshield, so you can look ahead while keeping your eyes on the road. 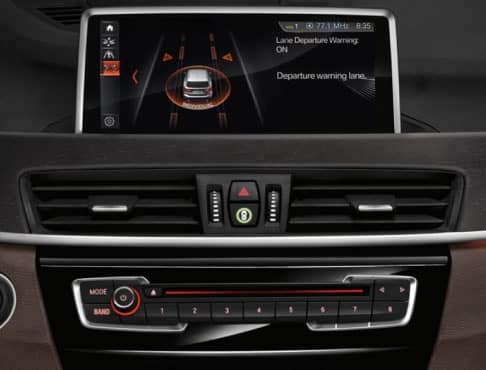 The intuitive interface of the latest BMW X1 iDrive system makes in-car entertainment simply enjoyable. 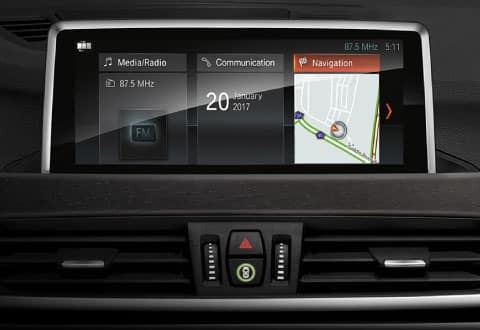 And the optional Navigation feature includes natural language understanding, so you can simply say where you want to go – and let your BMW X1 do the rest. 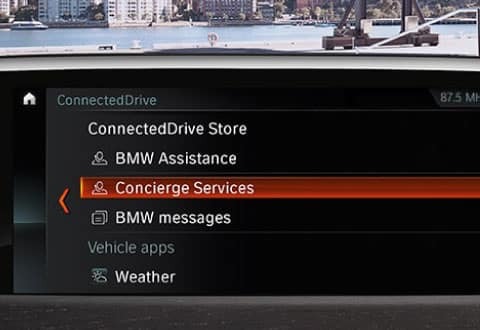 Arrive on time with the digital services of BMW Connected. Ask Amazon’s Alexa for trip details and to ventilate your BMW X1. The BMW Connected App will load your destination from your calendar, sync with BMW Navigation, and notify you when it’s time to go. Enjoy even more passenger space in our most compact SAV. 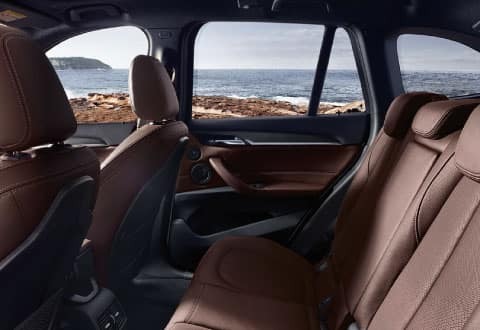 With a spacious 39.4 inches of rear headroom and back seats with optional sliding and reclining functions, the rear cabin is as comfortable as the front is exciting. Pure enjoyment. The BMW X1 inspires adventure wherever it goes. Standard features like the Sport steering wheel, power tailgate, and power front seats let you live in the moment – and let nothing come between you and the road. Driver focused. The Convenience Tier adds ease and comfort to your daily drive. Comfort Access makes it simple to lock, unlock, and open the doors and tailgate, while Power-Folding and Auto-dimming mirrors improve your view of the road. Enjoy natural light through the Panoramic moonroof – or attractive Ambient Lighting when the sun goes down. Always in the know. The Premium Tier adds BMW Remote Services, letting you control functions and check in on your vehicle right from your smartphone. 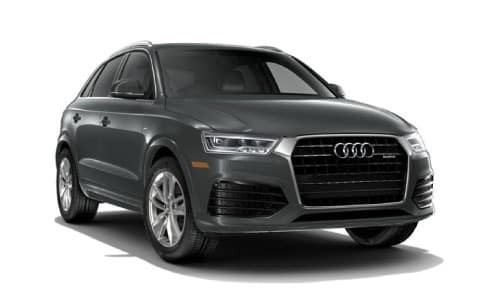 Once on the road, super bright and long-lasting LED headlamps illuminate the road ahead, while the Head-up Display and BMW Navigation provide driving information and directions. Peace of mind on every drive. While navigating the busy San Francisco roads, let your BMW X1 make it as simple and safe as possible for you. The many features of the Driving Assistance Package – from City Collision Mitigation to Pedestrian Detection – keep you aware of your surroundings and ready to take action when needed. Automatic high beams illuminate the road ahead, and Speed Limit Info updates continually as you drive. First class. Let your new BMW X1 shine with this dress-to-impress package. Fine-wood and Brushed Aluminum Trims with Pearl Chrome Accent and a Dakota Leather interior turns your cabin into an opulent driver’s dream. EXPLORE THE NEW BMW X1 NOW! The new 2018 BMW X1 models are in-stock here at BMW of San Francisco and ready for your test drive! Simply submit the form on this page, or call 800-872-2697 to schedule your personal BMW X1 test drive experience now. 1 Starting MSRP $35,900. MSRP excludes destination & handling fee of $995, tax, title, license, and registration. 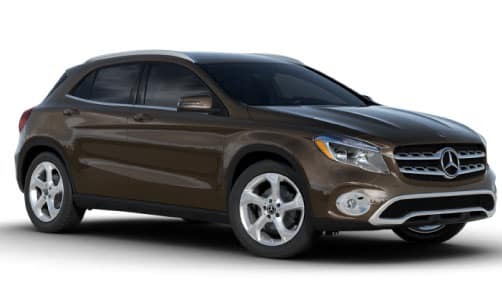 As listed by Mercedes-Benz as started MSRP of $35,400 for the 2018 Mercedes-Benz GLA 250 4Matic.